Deleted from the original version, Terminator 2’s hand glitch scene was reinserted into the later Collector’s Edition, bestowing the prop with the enviable trait of being “screen used.” The artifact disappears into a series of digital frames. Cut and spliced, graded, enlarged and isolated, the unpredicted possibilities latent within this new hand image-object are a microcosm of T2’s unforeseen future, a dystopic tomorrow determined by an outlier—the violent dethroning of bounded technology by its boundless successor. By detaching the hand from the spectacle of the silver screen and its overwhelming aura, Clemens simultaneously deflates a set of cybernetic dreams. The hand becomes vestigial. The prop is now useless. Instead, the object enters a purpose-purgatory—severed from its role in commercial image production but also lacking everyday utility. Form and function are decoupled; the object becomes out-of-place and its new artistic instrumentality is related to the hole it leaves behind. Like the mercurial T-1000 itself, Clemens’ appropriations unflatten the screen, teasing out the collapsed layers into distinctive strands: film as commercial enterprise, as cultural narrative, as collector’s commodity. Clemens’ low-tech assemblages and personal performances allow him to set up new relationships within this expanded field, exploring connections to other films such as A Nightmare on Elm Street, brands like Monster energy drink, or childhood memories at Universal Studios. His “unauthorised” interventions draw on the power of cinema as a communal cultural language but also destabilise it, rewriting a read-only surface. Playing at stereotypes, Deacon and Fraser have masked their friends in little girls’ tights and got them to assume the role of Aussie fanatics, re-enacting current events with sinister humour. Crudely drawn faces, with messy lip-sticked mouths, send up the anonymity (a tool of fear) sought by masked terrorists of all persuasions. The comic faces remind us that Deacon’s world and part of the world she and Fraser inhabit together is make-believe, a game of role-playing and performance carried out in the domestic sphere where negative stereotypes are problematised and drained of their power. Angry Flower is thirsty: preparing tea for his mother; this simple gesture turns into an act of submission. This is a narrative about a question that is stark and an answer that is sumptuously realised; synchronising to her shape, her strength, her feel, he draws together the ultimate ‘Truth Juice’, a muscle cocktail antidote to make her feel better. Meshing between Mother and Son, he envelops her on an innocuous island; this bud is ready to bloom, to be pollinated with devoted liveliness and the openings of long-lasting vitality. This is his effort of passing on the torch for a new beginning, a loop of infinite giving and offering the everlasting sting of 'the big sip'. 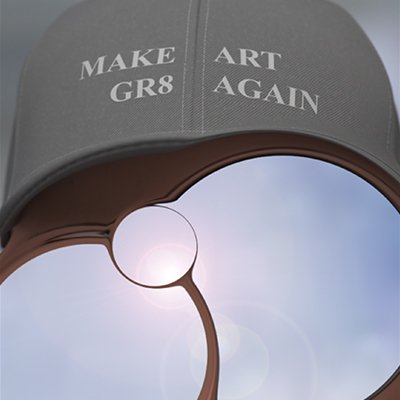 Courtesy the artists. Wagner Contemporary, Sydney. 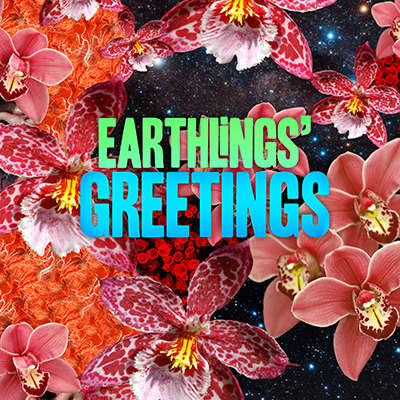 Earthlings' Greetings proposes an etiquette to frame our encounters with those who come to us from as far as stars. A collaboration between Deborah Kelly and Christian J Heinrich commissioned for Forever Now at MONA FOMA, 2015. Deborah Kelly is concerned with lineages of representation, politics and history in public exchange. Her collaborative and solo work has been shown in the Biennales of Singapore, Sydney, Thessaloniki, TarraWarra and Venice. Christian J Heinrich is an internationally exhibited filmmaker, video and projection artist. His new media work explores open text narrative discourse with a non-didactic fervour. 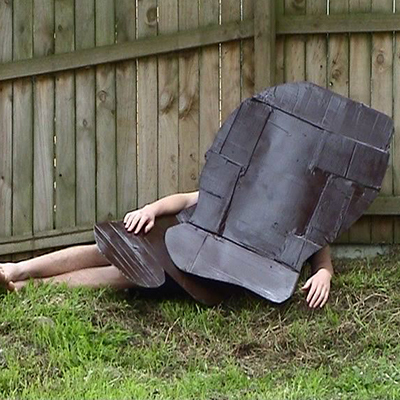 To my mind the most manifestly intriguing of Maloy's videos is 28 Compositions in which a boy wears a cardboard shell-like costume, a frontal prop, and bare arms and legs protruding from the rough edges from this dark, basic shape, which resembles nothing so much as a caricatured exclamation point. The costumed figure then acts out a number of set pieces, poses as a type of sculptural stutter, flickering from time to time into something recognizably iconic: the reclining, kneeling, or standing figure for the most part. It almost appears as if an introduction to sculpture had been stripped down into a pantomimed series of rituals. Ways to describe sculpture to aliens, maybe? The history of sculpture transformed into a desperate burlesque. Meanwhile this is all taking place- as a recorded on a rough, amateurish video- in a suburban garden, near a fence, beneath a tree. Extract from; Try and Try Again, an essay on the practice of Richard Maloy, published Broadsheet an Australian art journal, 2010, by Martin Patrick, an American art critic and historian currently Senior Lecturer of Critical Studies Massey University Wellington, New Zealand. Untitled (Clean Skin), produced intuitively in 2012, marked the end of a two-year period of process experimentation for O’Brien, which fostered the creation of several works of varying quality and resolve. Influenced by John Dewey’s Art as Experience, banal and ephemeral occurrences from O’Brien’s daily life were selected and re-created through manual repetition. In documenting these actions the artist hoped to extend his engagement with these occurrences and gain a deeper understanding of their qualities. Alt Right Arabesque (2016) continues Pailthorpe’s interest in the performing digital body, yet with a new focus on the aesthetics of the resurgent and re-branded fascism (the so-called Alt-right). The sickly-looking protagonist in this work symbolises the infamous 4chan moderator or frequent Reddit user, who spectacularly twirls en arabesque in box-fresh Nike Airmax. A variety of surreal political imagery, visual references and cinematic techniques long associated with fascism and propaganda in the history of cinema are combined in this animation to create a strange and intense response to the overwhelming weirdness of 2016. Working with my family’s archive, an average suburban home is featured in a manner which acts as portrait, chronicling its change over time. 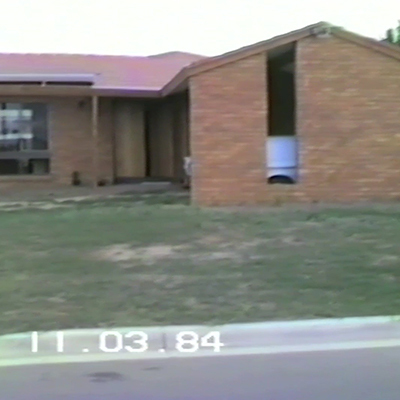 The house is featured this way through editing the found ‘home video’ to remove its human subjects — strangely revealing the original author. Given she is behind the lens, we barely see her, but the way she takes us through the house and the parts of it she chooses to feature tells us about her subjectivity. This new edit ‘turns the lens’ around onto the author, revealing what she feels is important to the viewer, and perhaps to herself.. Tomorrow is a video work compiled from videos downloaded from YouTube of young girls singing the song ‘Tomorrow’, from the Broadway musical Annie, about an orphan girl who wins a Christmas holiday away from the orphanage with Daddy Warbucks, a wealthy merchant who is looking to adopt. Abandoned, alone and longing for parents or someone to save her, Annie’s hopes and fears are expressed in the musical’s most identifiable song, ‘Tomorrow’, a song reminiscent of a relentless positivity. I made the work to comment on the fact that feminism, although having achieved so much, still has a long way to go. 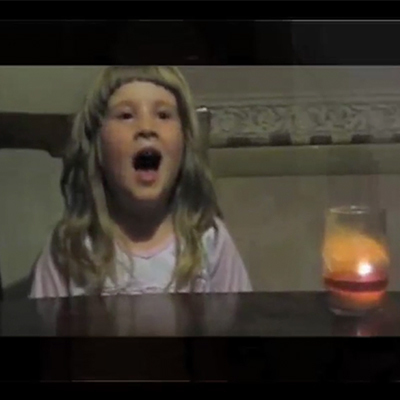 These young girls mostly alone in their bedrooms croon and belt out ‘Tomorrow, tomorrow, I’ll love ya, tomorrow, you’re only a day away…’ directly to the camera, a rehearsal, an audition or a lullaby to practise from a young age as a girl having to smile and stay positive. 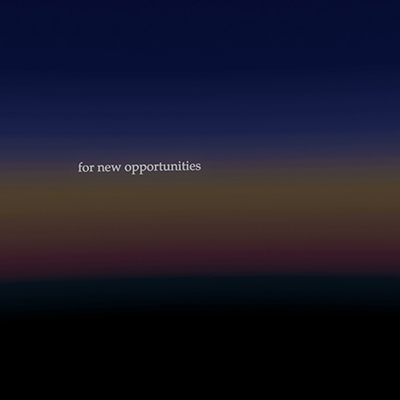 In Just Dawn, a series of white words and phrases fade in and out as a virtual camera flies towards an abstract horizon line. The narrative thread of the text is directed towards an unnamed protagonist through the repeated appearance of the words ‘you said’. 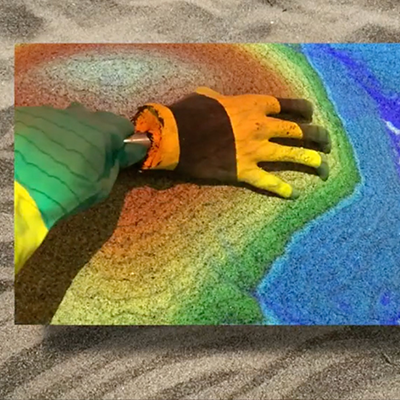 As the video progresses, the colours of the animated background slowly brighten to resemble an emerging dawn, and the sound, text and camera movements build in frequency and intensity. As they do so, the once optimistic outlook becomes increasingly unsteady. Just Dawn was originally commissioned for the It’s Timely exhibition at the Blacktown Arts Centre in April 2014. The work is a response to two speeches that former Australian Prime Minister Gough Whitlam delivered in Blacktown in 1972 and 1974. 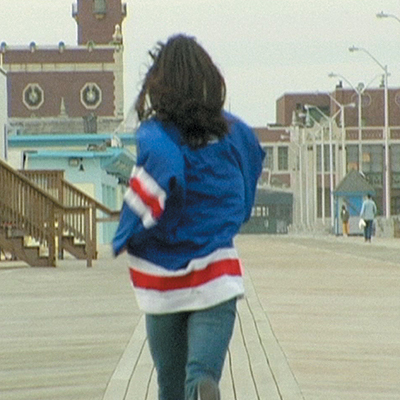 Sylvester’s video Time Keeps Running Never Changing Never Ageing, shows a woman running through the empty streets and board- walks of Asbury Park – Bruce Springsteen’s decaying hometown referenced in many of his songs. The video is accompanied by the epic saxophone solo that appears in the song, ‘Jungleland’, performed by a Springsteen tribute band from Ohio. The video is looped so the young woman is seen to run continuously without reaching a destination. She is in a time warp, forever trapped in a small town with limited possibilities, but unable to break free of the compulsion to try to get somewhere. She is born to run. 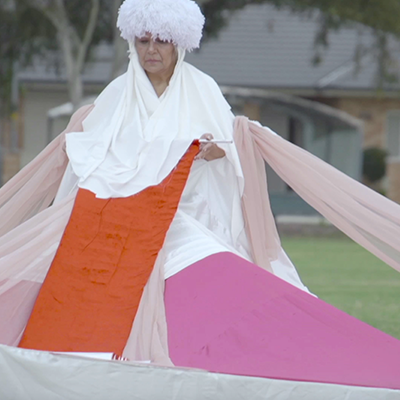 Woman’s Movement by Angela Tiatia explores and imitates the physical movements communicated by iconic female singers in popular music videos of today. Five objects that feature in their music videos are also replicated and presented by the artist. In this work the female performers are anonymised and de-individualised while emulating feminine and provocative dance gestures and postures. Through repeated pursuits to perfect these movements, the figures are shown in various states of failure and exhaustion to re-humanise, re-politicise and decolonise the body from the pervading prescriptions of pop culture. Hawk embraces the notion of looking skyward and solitude encapsulated in the observation of a lone hawk flying upward using thermal air currents. 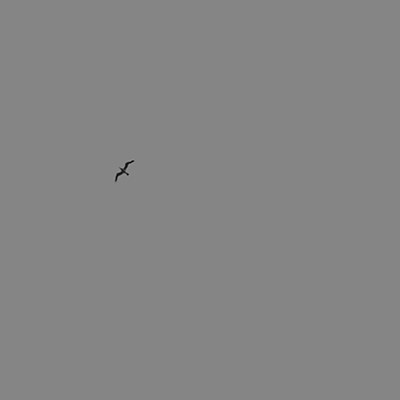 Hawk is a metaphorical notion relating to contemplation within the rigours of a creative practice and as a refrain from the flux of existence. 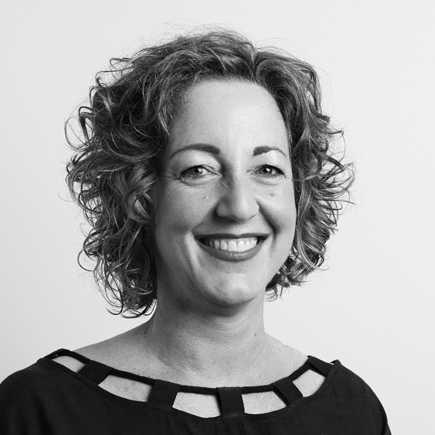 Kelly Gellatly is the Director of the Ian Potter Museum of Art at the University of Melbourne. An internationally recognised exhibitions and collections curator, she was Curator of Contemporary Art at the National Gallery of Victoria from 2003 to 2013 and has also held curatorial positions at Heide Museum of Modern Art, Melbourne and the National Gallery of Australia, Canberra. Kelly has curated over 30 exhibitions of the work of leading Australian and international artists and has published extensively on contemporary art and photographic practice. Her most recent curatorial project is Stieg Persson: Polyphonic, a 30-year survey of the work Melbourne-based contemporary artist Stieg Persson. She is currently part of an Asialink Global Projects curatorium which will see Heather B Swann’s project I let my body fall in to a rhythm exhibited in Tokyo and in Melbourne at the Potter in late 2018. Kelly is currently working on a major redevelopment of the Potter Art Museum with celebrated Melbourne-based architects Wood Marsh, due for completion in early 2020.